To All Potential Advertisers, The Break will promote your tournaments before and after your event. We cater to our advertisers to bring as much exposure to your location as possible with a listing on the tournament trail and in your ad before your event. After we will promote your location and players with an article, photos and the results of your event. Call to see how!!! customers by putting on a trick shot show. He was by no means rusty. He was in dead stroke. I think everyday around a pool room keeps you in shape, no matter how old. I was happy for Jimmy, because with all the recognition, he seemed to be thoroughly alive. Really a cool thing to see in a man of his age. We always ended up at the Condella’s pool room at the end of the night with Jimmy outlasting us all. That is the truth. Till the wee hours, Jimmy still wanted to keep it rolling. He would call us amateurs. HaHa. On one afternoon, we took Jimmy on a tour of Key West. We went to Hemingway’s House, the “90 Miles to Cuba” Marker, Cruised the Navy Yard, and checked out the famous Duval Street. Also got the grand tour of Key West Welding, where Steve & Madeline make their living. Very impressive, with High Rise Cranes, and a huge Metal Fabrication Shop, always busy with projects. Everything must come to an end as our final night was spent at the Condells’a. We were all gathered at their pool room as usual with a few extra guests. Standard procedure was talk about the old cues as you can’t imagine the history here. This always wound Jimmy up, as well as just playing the game. This time we could not pry Jimmy away from his work. The hours peeled off till it was 3 in the morning and our plane was to leave in 6 hours. We finally got off to get some rest before departing. It was tough getting up and we were close to missing our flight but we made it. I do believe Jimmy was not interested in leaving but reality had set in. He had many excuses why we should stay longer. He was very amusing. Great guy with great sense of humor . Now back home at Drexeline Billiards, Jimmy for months talked about his trip to all our customers. The sights, the locals and their hospitality, the wonderful seafood, and most of all our hosts, Steve & Madeline. I think Jimmy adopted them. He could not say enough about these kind people, who graciously opened there doors to us. We could all tell that this trip was on the top of the chart for Jimmy, out of all the places he had been during his life. Jimmy had a great time. Billiard Action at MA’S TAVERN 9-B A L L Sun and fun took many of the usual contenders of our BIG SHOT 9 Ball TOURNAMENT off in other directions on August 20th! But of the 14 who did show up, the well known Glen Atwell was a new presence!! The House, Ma’s, added $100 to the players pot, bringing it to a total of $310 to be won! In the end Matt Horner prevailed to take 1st place for $160!! Followed by Luke Thomas in 2nd for $90, Tom Brady took 3rd for $40 and Rick Copeland finished 4th with $20! As summer winds down, we expect a much bigger, better showing for our next BIG SHOT 9 Ball TOURNAMENT, which will be Saturday Sept. 17th and Sunday Sept. 18th (the 3rd weekend of the month). It was a fun time for all!!! Rich Y. Dave G. Gary S. Mike S. Ron Y.
the top five list that we have not seen for a while or at all; Mike Sano and Ron Yu, welcome to the top five club gentlemen. Well done. Leslie Bernardi and Shawn Modelo claimed the top two women shooters of the league, which they hold steadily; their game’s continues to get better. The size of this league has grown from 18 to 23 teams consistently and all participants enjoy the tough competition and the high handicap they all have to carry against each other. (140%) The level of game for the open league has evened out in such a way that there is not a dominating team anymore. So if u like the game of pool on bar boxes and want to meet the challenge while having fun meeting players from all over, please join us. It is tradition for DVPL to hold a team tournament at the end of each season. This season the tournament included 16 teams. It was a busy evening at Rack Em up and it went on until late night. The entry fee was $32 per team and $300.00 added from DVPL. THE PRIZE POT WAS: First: $320.00 Frankie – Farrington’s Second: $240.00 Jim – The Office Third: $160.00 Aljoe – Bar None Fourth: $92.00 Dave - Clayton bowl Frankie’s team from Farrington’s, a former champion proved to all that they have that A 2ND PLACE, BAR NONE game and the endurance to shoot Bee Davison, Captain Aljo Mandoriao, into the early morning hours. Haythem Fahima, Mike Sano (4th Top Shooter) Thanks to our sponsor Rack Em Up for hosting our End of The Season Tournament. curve a little even before hitting the object ball -- keep aiming for a thinner and thinner hit until you are just wiggling the four. Shot perfectly, the cue ball will come off the side rail and freeze to both the nine ball and the cushion. At that point, you’re famous at least in that room for 15 minutes. When facing safes, consider the low-speed finesse option. Often it will provide the best chance for a good returned safety. follow through, You’ll need to use at least a 10 inch bridge length so you can execute a long fast warm up stroke. I cue the cue ball with a touch of left English and a touch of draw. The closer the cue ball hits the fifth rail by pocket E, close to scratching, the better your chances of making the shot. If your head is low on the cue when you shoot pool, stand up more so your upper body doesn’t get in the way as you follow through with this powerful stroke. One of the top trick shot artists in the world, Sarge now calls Las Vegas his home. He is looking to resume his trick shot exhibitions which made him famous throughout the Northwest. ... look for him in a pool room near you. happen. One little mistake is all it takes to lose the match. After he won, he was told he may not be able to come back. One of the B players had complained that he shouldn’t be allowed to play. Coincidentally, this same player has made it to the finals of this weekly tournament on more than one occasion when the competition was not as steep. This is also a player that had done well in some handicapped events in the past. None of the C players were complaining. In fact, many of them were happy for the chance to draw him. They understood that $5 is such a small investment for such a big opportunity. Not only has Marc given free lessons to the complaining player but so has one of the other AA’s that’s been banned from that tournament. In fact, the other AA has provided countless hours of free instruction to the entire community for years, and this is the thanks he gets? What message are we sending if we ban the top players from weekly tournaments? Do we not want them to play because we fear the competition? Or, do we not appreciate the value of the knowledge we can gain from them? Handicapped tournaments help make the game more fair, but is the format alone not enough of an equalizer? When you become dependent on handicapping, it becomes a crutch. When you begin expecting handicapping, then you’re in trouble. What will motivate you to improve when you don’t have to? So, the next time you’re at an open tournament and you draw one of the favorites, instead of getting discouraged or complaining to the tournament director, be grateful. Feel fortunate for the opportunity to play someone of that level and play your heart out. If you lose, it was a learning experience. If you pull out the win, then you earned it. Play your best. Appreciate the challenge and the chance to excel. and league night). Felt is also bringing on board professional instructor and billiard personality, Samm Diep as the new house pro and marketing director. Diep will be offering private instruction and pool schools. She also brings with her the long-running Free Monthly Pool Clinic. “I am super excited to bring the players back and show them that we’re here to stay. Felt is already proving that we really care about the players. Together we plan on resuscitating the Denver pool scene,” said Diep. Joseph Stewart, owner of Felt, also added, “ Samm’s professionalism, energy, and enthusiasm for the sport is unmatched, and we are looking forward to her bringing that energy and enthusiasm to the many events and activities we have planned in the coming months for the Colorado pool community.” The weekly big-table and bar-table tournaments are returning and the room plans to host some larger scale events in the near future. Felt Billiards is located at 101 W Floyd Avenue in Englewood, Colorado. For more information about Felt, visit their website at www.FeltBar.com, or Facebook page at www.facebook.com/feltbar, or call 720.266.6190. 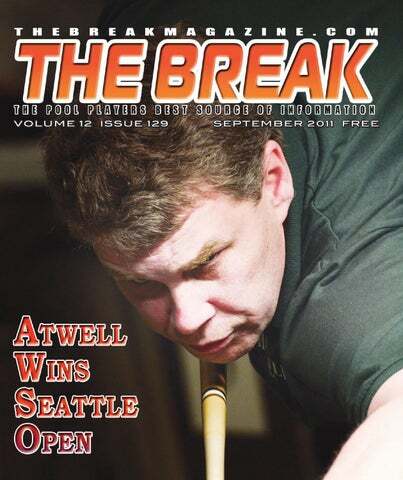 The 5th annual Seattle Open at Uncle Jack’s Billiards was held Aug.6-7 , chock full of the best players in the NW. With most of the usual suspects in attendance in the end it was probably the best known standing on his own...Glenn Atwell. Play got underway with 33 players competing for a share of the over $3000 prize pool. This number was made possible due to our sponsor Dave Jones Custom Cues. Dave made one of his beautiful cues to raffle off and as usual it was easy to sell all of the tickets. The envy of all who purchased some was winner Margie Avlon who bought 2 just to support the local players and business’. Dave Jones donated all the proceeds ($550) to the purse all of which was designated to first place. A special thanks to Dave for his role in making this a very successful tournament and adding to the prestige it already had. Uncle Jacks owner and staff went the extra mile to make sure we had everything that was needed to have a smooth running tournament and happy entrants. Starting with getting the cloth replaced so its all the same now,table mechanic Randy Smith handled this part having the tables playing better than they have in years. Talya and myself made sure the tables and balls were clean and ready for play. Jacks is now serving breakfast at all its events. Anna and Angel were on hand early mornings to to all the cooking and serving the players. Katelyn, Candice and Annie tagged in for the second shift doing lunch and drinks for those waiting to play or drown the sorrows of those out. Jack’s has been doing things like paying high woman and keeping the race to 9 on both sides to entice those who may be on the fence to play. I believe their hard work paid off as a good time was had by all. Randy Camantigue (owner) has been working hard with his people to run some of the best tournaments in the Northwest. I hope they keep it up as all the players said they are on the right track and look forward to our events. Please note: You will need to fully concentrate on this article. It is not real easy to grasp. I teach this aiming system to students who come to The Monk Training Center for this reason. I’d like to share it with you. I talked to a master BCA instructor and he told me he had nine different aiming systems. I wondered why there would be more than one aiming system. What I teach on the subject of AIMING is that the very 'thing in itself' behind the human mind's control of the cue ball could prove that directional control is not as is usually believed by most of the players. In other words it is not the focus on the target. Aiming is not the 'slight trick' of either our sight, (focus) nor that of the muscles of our hands, but it is the 'slight trick' of our mind which is the mental chanting of a simple thought at the time of stroke delivery. This is what I teach and it is not easy to train a person in the true art of aiming. They must be ready. In reality all I have done is helped them to develop an acute sense or feel of His presence (OM energy) that is always made available on their minds through their act of concentration. That visual confirmation of the target comes from a higher source and if you do not deliver the stroke when it comes, you will miss the shot. That’s why the ability of getting the directional control of a ball is regarded as a thing of feel, or something instinctual. His presence or grace is made available on the mind in the form of a ‘thought’. This ‘simple thought’ purely a non-material thing is the Absolute Reality behind the directional control of the motion of a cue ball. In fact, it is a thing like ‘mental chanting’ that is affecting the direction! Without this ‘chant’ the motion of a ball or an arrow is impossible or at least the direction of it is out of our control. I can set up a series of shots for you that require a certain stroke and attitude to make the ball. You can aim perfectly and not make the shot. It takes a stroke along with an attitude to pocket the ball. I offered many of these shots in The Lesson. Our visual focus or our knowledge of all the externals like aim point, angles etc. has nothing to do with the shot making of the master players. What matters is that the ‘mental chanting’ is done or not done consciously or unconsciously (as a trained champion does). For this non-physical agency the subject has to depend on his concentration. This thing that we call concentration is not, as we suppose, brain related. The very concentration is nothing but a mental process of invoking that divine non-physical agency. If this were not true you would never say, “I had great concentration today, or I lost my concentration”. If it was just brain related you would always have great concentration skills. The subject is able to achieve the directional control of his shot as long as he is able to fix his mental focus on this non-physical divine thought that is made available on his mind through his invocation (concentration). When an opponent upsets this divine thought, concentration breaks down. When the subject tries his concentration skills he thinks he must experience ‘emptying’ the mind or fixing our visual focus on a specific target but this process is not done in concentration, it is done in the name of meditation. Have you heard the term, “become one with the shot?” When you can reach that point where you are connected, and this connection is bound together by a divine spirit your visual ability to see the shot is enhanced. There are times when you simply know you are going to make it. You know you are locked in. You know you will not miss. You can contact The Monk by going on my web site. www.monkbilliardacademy.net and while you are at it, contact me for a FREE E Book. The Greater Midwest Poolplayers Association will be directing the 3rd Annual Southwest Amateur Pocket Billiard Championships at Bull Shooters Bar and Grill located at 337 W Peoria Ave. Phoenix, Arizona on Oct. 6th-9th, 2011. Added to the event purse will be $5750. (based on full fields) by the host location. Over $20,000. will be awarded in the 18 events. Thursday kicks off open 9-Ball with ladies and men division. Friday/Saturday various 8-Ball singles events . Dr Cue, Tom Rossman, ESPN Artisitic Champion, will be conducting Artistic Qualifiers and will perform a dazzling Trick-Shot show each evening. Saturday afternoon the Sportsman no entry fee tournament begins for the unfortunate players that bowed out of the regular event early at 0-2. or 1-2. Saturday evening the male/female Scotch Doubles tournament commences. Sunday the Lucasi 8-ball singles and the Youth singles finish the event. All play will be on coin operated bar boxes and 8â&#x20AC;&#x2122; bar tables. A dress code will be in effect for all participants and professional referees will be on hand. New this year is the Bronze division designed for the occasional type player. Fees to play are as follows, Seniors, Gold, Silver, all 9-Ball, and Lucasi singles are $35.00, Platinum, $60.00, Youth $20.00, Bronze, $20.00, and Scotch Doubles, $60.00 per team. All divisions except youth have registration fees. All prize money will be paid out at 100%. All added money paid according to the size of the field. There will be cue giveaways, billiard supplies, with food and drink specials daily. Also, from ESPN eight time world champion, Nick Varner, will be on hand for challenge matches, unusual shots, demonstrations, and autographs. No cost spectator admission fees for the four day event. All players must have a minimum of 4 weeks of play in an amateur league system sanctioned by APA, ACS, BCAPL, TAP, UPA, VNEA, and recognized independent leagues. No professionals ranked by WPA, AZ Billiards, or the WPBA will be allowed. Host hotel is the Comfort Suites with $50.00 room rates, call (602)-861-3900, use code, GMPA Pool. Sign up in person at Bull Shooters, 3337 W Peoria, Phoenix, (602) 441-2447. Cash, money orders, approved checks, and charge cards accepted. Entries can be mailed to GMPA, 2278 Willowcreek Rd, Portage, Indiana, 46368, money orders or approved checks only with mailed entries. Phone inquiries welcomed by Cecil Messer at (219) 465-8101 or JulieAnn Mitchell at (219) 771-1174. FOR MAXIMUM CONTROL & ACCURACY. HXT yers S Cueport ! WWW.PLAYERSHXT.COM A Global Division of Cue & Case Sales, Inc. Wet T-Shirt Contest Coming Soon!!! The Official Rules of the BCA Pool League is widely used within the BCAPL and by non BCAPL players all over the world. Earlier this year CueSports International (CSI) launched the Spanish language version of the Official BCAPL Rules and now you can download both the Official Rules of the BCA Pool League (English version) and the Reglas Officiales de la BCA Liga Pool (Spanish version) on your Amazon Kindle or Barnes and Noble Nook. Kindle users can purchase both language versions online at www.amazon.com via the Kindle Store. Nook users can purchase both versions at www.bn.com. The price is $3.00. When the first edition of the BCAPL rule book was published in 2007, well regarded cue sport historian and journalist Mike Shamos reviewed the book in the July 2008 issue of Billiards Digest. He said, “The (BCAPL) rules themselves and their interpretations have been given a great deal of thought, and the reasoning behind them is not hidden but is right there on the page. They’re also based on a great deal of experience with problems that surfaced in actual league situations. They don’t make the mistake of sacrificing the integrity of the game just to keep down the number of disputes that arise, which is a flaw endemic to league rules generally. I have the feeling that because of their logic the BCAPL rules just may become the dominant rules of the game.” The Kindle and Nook launch of the Official Rules of the BCA Pool League is another step by the team at CSI to increase the use of technology in the pool community. In addition to this recent launch, CSI also created and launched the most progressive online tournament tracking and registration system in the sport, the CueSports Tournament System (CTS). For more information about CTS visit www.ctsondemand. com. second, she pounced on a scratch by Bonnie to take a 2-0 lead. And so it went, although Bonnie continued to make good shots and both players made mistakes, it was Mary who took advantage of the openings given to her to run the second set 5-0 and win first place. MAIN EVENT RESULTS: 1	$450	Mary Rakin 2	$300	Bonnie Plowman 3	$220	Emilyn Callado 4	$150	Rachel Byrket 5/6	$110	Connie Eddins, Holly Robinson 7/8	$75	Sher Ahola-Caruso, Erin McKibben Fifteen women competed in the Second Chance Tournament. 1	$85	Jeanne Christiansen 2	$55	A Aiem-sa-ard 3/4	$35	Deborah Cullen/Claudia Wong Our thanks as always to our sponsors: Tiger Products, Magic Rack and DVPL. Many thanks to Hard Time Billiards for adding a combined $750 to the main event, second chance and end of season prize funds. Personal thanks to Karen, Crystal, Tony and the rest of the staff for their wonderful hospitality. New at this stop was the presence of therapeutic chair masseuse Eileen Hanshaw throughout the day on Saturday. The massages were heavenly and a portion of the proceeds were donated towards the Tour. Thank you Eileen! Our events are live streamed on Sundays by West Coast Pool Players—go to their website for the link or to catch up on archived matches. Come join us as a player or spectator. Our next stop will be Sept. 16th-17th at South First Billiards in San Jose. It will be a good time—hope to see you there. Home of Frosty Beer and Where Old Rockers Meet! 6 AWESOME TABLES Plus: n Darts n Horseshoes n DJ Thurs-Sun n HUGE Beer Garden n Excellent Food n Great Staff! ESPN does not have any scheduled telecasts of pool/billiard events for the month of September. week, as it was a very pleasant surprise. Charlie Williams also returned my call in which he also had encouraging and pleasant things to say. Barry and Shannon would also like to thank Dennis Walsh, the attorney for the ABP for the long hours of cordial negotiation, conversation and compromise. While the pool public in general was under the impression that discussions were not taking place and that each side had stubbornly drawn a line in the sand, rest assured that representatives of both camps were busy trying to reach a workable solution and that many others in the industry were pitching in with offers of help and other valuable advice. So let's get ready to rack some balls come October 16-22 and players don't forget that one week prior to the event there will be a $50 late fee, so please get your entries into: the BCA at 12303 Airport Way, Suite 140, Broomfield, CO 80021. Hotel information can be found on your website, www.usopen9ballchampionships.com . Ladies, we hope that you all return this year and we encourage others to participate as well. Our goal is to fill the field of 256 players again; it would be an awesome feeling for everyone. Great News and Great Times Planned 2012 Lucasi Hybrid ACS Nationals at the Tropicana Las Vegas! Pavilion area. The Ballroom will be reserved for practice play, mini’s and the USBA 3-Cushion National Championships. Already the tourney was huge fun to attend: Super organized with 5 different Singles, Scotch Doubles and Team events you can compete in (both 8Ball and 9Ball), all in only 7 days with no conflicts. Unlike anybody else, a Standard Division with full Cash Prizing is offered in all events where you don’t have to be a semi-Master or Open calibre to stand a good chance at winning a few matches. The Tropicana itself proved to be an incredible host site with it’s ‘center of the action’ location on the Strip, completely updated and renovated rooms (all with larges screen tv’s) right above the tourney room, the best pool area in Vegas, a very generous Gambling Awards program that reciprocates Riviera Awards levels and the most friendly staff ever encountered! For those on a tight budget, food options were within convenient walking distance. Now there’s even more reason to go. Win or lose, you’re guaranteed to have a great vacation! CALL FIRST: Dates, Times & Tournaments are subject to change without notice.